Aquacultured specimens of Symphyllia Brain Coral vie for a top place as one of the most colorful brain corals! The Symphyllia Brain Coral Symphyllia sp., popularly known as the Closed Brain Coral or Dented Brain Coral, is attractive and hardy. Symphyllia Corals include some of the most richly colored aquacultured corals available today. With dynamic colors and color combinations, similar to the classy Acan Lord Acanthastrea lordhowensis, these captive bred specimans can make an awesome reef aquarium showpiece. In the wild, the Symphyllia genus forms flat or dome shaped colonies. These colonies have wide valleys that meander in curves and twists throughout the coral. At times the valley can be so spacious, such as on a new, single polyp, that it can look like a completely different species. Each polyp has a unique shape and some have bumps, or ridges in the middle of the polyp. Some of the names they are known for are Symphyllia Brain Coral, Brain Coral, Dented Brain Coral, Closed Brain Coral, Symphony Coral, Meat Coral, Wrinkle Coral, Pacific Cactus Coral, and Closed Lobophyllia. Symphyllia sp. are usually creamy or pastel hues of greens, reds, creams, and muted browns with the valleys often having contrasting colors. At times, brighter green and white combinations can be found. They have been propagated in captivity with great success, leading to a variety of colors and combinations of colors. The names used by reef farmers are quite creative, such as Candy Apple Red Symphyllia, Minty Green Symphyllia, Red Twister, Baby Blue, Bleeding Apple Rainbow, Pink Rim Blue, Pink and Red Symphyllia, Nuclear Green, Boiling Point, and so forth. The Symphyllia Brain Coral Is very closely related to the Lobophyllia genus, and though less common, they require much of the same care. This genus of corals can be confused with Lobophyllia, but are distinguished by the skeletal structure. Symphyllia corals have corallite walls that are joined or fused together, rather than having the separate corallite walls found on Lobophyllia species. Like the popular Lobed Brain Coral Lobophyllia hemprichii, the Symphyllia Brain Coral is a good beginners large polyp stony (LPS) coral. 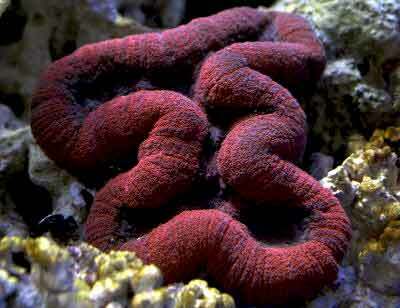 Yet the Symphyllia Brain Coral is not as aggressive, and can actually be more tolerate of stings from other corals. For as hearty as these corals are though, they are sensitive to several soft corals, including Xenia and Litophyton species. Lack of growth and tissue recession is an indication that your brain is not happy. The Symphyllia Brain Coral is one of the easiest of the LPS (large polyp stony) corals to care for, and it easy to propagate. Use moderate lighting, and a low to moderate water flow that is turbulent. Since they are found in several lighting environments, watch your coral to see how it responds in your tank and adjust the light accordingly. You can do this by placing the coral higher or lower in the tank. It is best to start at the lowest point and work up. Distribution / Background Symphyllia Coral Information: The Symphyllia genus was described by Milne-Edwards and Haime in 1848. There are 13 nominal species, 7 of which are true species with 5 being found around Australia. The valid species are S. agaricia, S. erythraea, S. hassi, S. radians, S. recta, S. valenciennesii, and S. wilsoni. Some common names these corals are know for are Symphyllia Brain Coral, Brain Coral, Dented Brain Coral, Closed Brain Coral, Symphony Coral, Meat Coral, Wrinkle Coral, Pacific Cactus Coral, and Closed Lobophyllia. The Symphyllia sp. has been propagated in captivity with great success. Where Symphyllia Corals Are Found: The Symphyllia genus are found in the Indo-Pacific Ocean including the Red Sea to the Gulf of Alden, and the Philippines to Indonesia, and Somalia. One species, S. wilsoni is found in the Eastern Indian Ocean on the west coast of Australia in subtropical waters. Symphyllia Coral Habitat: The Symphyllia genus are found on protected reef slopes in shallow water, as well as upper reef slopes and fringing reefs. They feed at night, extending tentacles. They can be long-lived in captivity, but their actual life span is unknown. Status The following species from the Symphyllia genus are on the IUCN Red List of Endangered Species. Description What do Symphyllia Corals look like: The Symphyllia genus can grow in colonies that can be flat or dome shaped, with wide valleys that meander in curves and twists throughout the coral. At times, the valley can be so spacious on a new, single polyp, that it can look like a completely different species. All the corallites are fused together, yet you can often see the divisions due to a groove that runs along the top of the walls, between each one. These can be brown, red, or green, and a mix of those colors as well. The 1.3" (35 mm) valleys do help to identify this one from others in it's genus, having some of the larger valleys. The colonies can be flat to hemisperical with straight or curving valleys. These are found only on exposed upper reef slopes. These has a wide range of colors, but the .8 to .9" (20-25 mm) valleys do help to identify this one from others in it's genus, having "medium sized" valleys. The valleys are straight in flat colonies and irregularly winding in the dome shaped colonies. This species may be found in upper reef slopes and fringing reefs more often than others. These can be dull brown, green gray and red and a mix of those colors as well. It is hemispherical or dome shaped with fine septa, or teeth at the top of the skeletal structure. The valleys are about 1/2" wide (12-15 mm) and has many turns and curves. These are usually flat. The valleys are erratic in shape and length, with septa being close to Acanthastrea. They can be mottled in green, gray, purple and brown. This Symphyllia species is found only in the Houtman Abrolhos Islands with water temperatures between 68 - 71 F (20 -22 C), so that needs to be taken into consideration if purchasing this species. Difficulty of Care Symphyllia Coral Care: Like other Mussids, the Symphyllia sp. is easy to care for, making them an excellent choice for the beginner. Use moderate lighting and a low to moderate water flow that is turbulent. Since they are found in several lighting environments, watch your coral to see how it responds in your tank and adjust the light accordingly, by placing higher or lower in the tank. It is best to start at the lowest point and work up. Like other members of the Mussidae family, the polyps tentacles come out at night to feed. But they will morph to extend their tentacles day or night when food is present. Foods / Feeding Symphyllia Coral Feeding: The Symphyllia genus, like other large polyp stony (LPS) corals, have developed several feeding strategies. Through a symbiotic relationship with a marine algae, known as zooxanthellae, they receive some of their nutrients. They also capture planktonic organisms, food particles from the water column, and can absorb dissolved organic matter. In captivity, Symphyllia sp. does very well being be fed finely minced fish and shrimp flesh, as well as other small foods like mysis, rotifers, newly hatched brine shrimp or Cyclopeeze. Some have noticed a response with Phytoplankton as well. Feed once a week or depending on how much the coral is accepting food. Highly stocked tanks with fish resulting in foods drifting into the Symphyllia's tentacles may lower the frequency of spot feeding. The following water supplements are suggested for Symphyllia species: Trace elements and iodine may also be added. Aquarium Parameters A well-feed live rock/reef environment is what is needed for your Symphyllia Brain Coral, along with some fish for organic matter production, and dissolved organics. A mature tank is recommended. Be sure to have proper water movement and lighting. Provide a low to moderate and turbulent water flow and moderate to high lighting for the best health. Place them securely to prevent them from toppling over and damaging their tissue.This is an peaceful species, and they tolerate their own species as well as other corals. Compatibility and Social Behaviors The Symphyllia genus is peaceful and they tolerate their own species. Other genus in this family, though, like Lobophyllia species will sting them. This coral is not as bothered by the stings of other corals, yet are sensitive to some soft corals like Xenia and Litophyton species. The Symphyllia genus are hermaphrodites that use external fertilization in the wild. In captivity propagation is done with severing. Start with a healthy and well adjusted animal. Use a dremel, electric saw or saw to make a clean cut. Cut through the middle of the coral to make 2 halves or 4 quarters. Put the newly cut frag in clean water with turbulent water flow and moderate light to help it heal. Potential Problems The Symphyllia sp. are attractive and durable when their needs are provided for. Tissue is subject to tearing if not handled appropriately. When removing from water, gentle shake the coral until most of the tissue has retracted, or it can be torn from its own weight when removed. Availability Symphyllia Corals for Sale: The Symphyllia sp. is very easy to find at pet shops and on line. The cost for online stores is around $80.00 to $120.00 USD per polyp depending on size and color.